A Hydra host is an application that provides the ability to load (host) and use the exposed functionality of a plugin. Host applications are able to use all plugins supported by Hydra (with the exception of RemObjects SDK plugins). 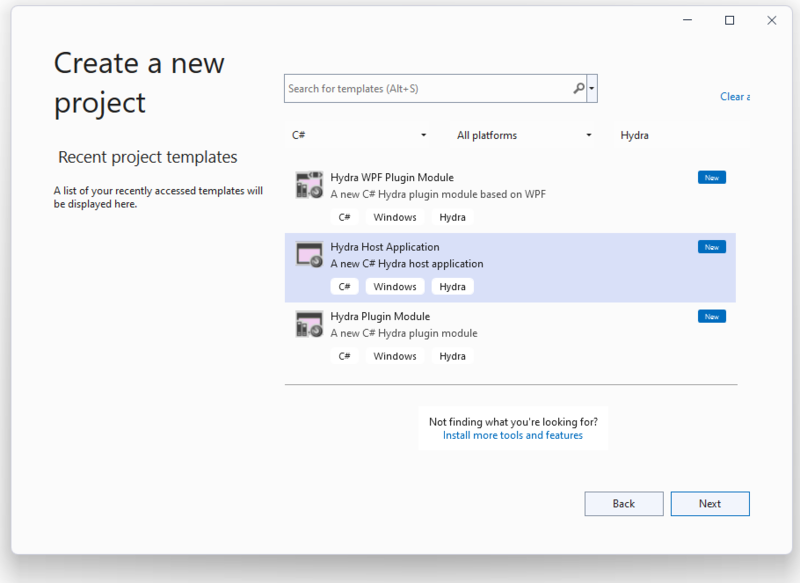 Windows Forms (WinForms) is Microsoft's visual component-based framework, and Hydra WinForms hosts are the second most used host applications for host applications. In this article we will learn how to create a new WinForms host application, and talk about what features it provides and how they can be used. A Hydra host application is basically a common application. Our wizards can create this application for all supported platforms, so you can have a WinForms, VCL, or FireMonkey HD application. By default there aren't many changes done by the wizard, the main one being that it adds a module manager component that allows you to interact with plugins. However, for some host projects it adds additional items, which will be described in the "Review the resulting project" section. All this allows you to easily convert your existing project into the Hydra host project. Now let's create and set up a Hydra host project. In this dialog you also need to enter the project name and destination folder. And basically this is it, after finishing its work, the wizard will create a new application that is ready to work with Hydra plugin modules. As mentioned earlier, the host application is a common Windows Forms Application, so when the wizard is done, you will receive the same project as you would with a regular template. Program.cs - The entry point of the application; contains code that runs your application and main form. Main.cs - Main form of the application, a regular WinForm. The wizard also added a new component to the main form, the module manager, a key component that allows you to manage your plugins, which will be described later in this article. Please do not change this attribute, it will allow plugins to access the interfaces exposed by the host application. By now you will have a complete project that, with a little bit of additional work, can be used to work with plugins. The host application can load any plugin module, regardless of what platform it was developed with, allowing you to mix Delphi and .NET functionality in the same application. I will describe how to do this later in this article. The host application is a common WinForms application, the main form generated by the wizard is inherited from the standard System.Windows.Forms.Form class and provides exactly the same design surface, so you can work with the host application like you do with any regular WinForms application. For host applications, the ModuleManager component is a key component that allows you to perform the task of managing plugin modules. So, let's start with a short description of module manager members. GetModuleFileNames - Uses the specified search path to populate a list with module filenames and returns the number of modules that were found. CreateInstance - Creates an instance of a plugin with a specified name. CreateInstance returns a reference to a IHYCrossPlatformPlugin, however, you can also use the CreateVisualPlugin or CreateNonVisualPlugin methods to create a specific plugin. ReleaseInstance - Releases an instance that was created by the CreateInstance method. This is equivalent to setting the instance to nil. You need to release all the references to a plugin instance before you can unload a module or shut down your application. LoadModule - Loads a module with a specified file name, and can optionally create a new AppDomain for .NET plugins or use a global one. Returns an index of the new module. This method will automatically define the plugin module type and will call on the module manager methods to load the specific module. You can also do this manually by using methods such as LoadUnmanagedModule, LoadFiremonkeyModule etc. LoadModules - Provides the ability to load a set of modules with different methods like by search path, from list of file names, etc. UnloadModule - Unloads a plugin module by using a reference to the module, index or file name. The UnloadModules method allows you to unload all modules. FindModule - Searches for a loaded module by a specified file name, returns nil if nothing is found. ModuleByFileName does the same search, but will throw an exception if the module wasn't found. FindPluginDescriptor - Searches for a plugin descriptor by the specified name, returns nil if nothing is found. PluginDescriptorByName does the same search, but will throw an exception if the descriptor wasn't found. As you can see, the module manager provides a couple of members that allow you to access the modules and descriptors. Every plugin that was loaded by the module manager is represented by a special class that describes this module. All modules are descendants of the LoadedModule class and allow you to get access to module data. ModuleController - Holds a reference to an instance of the plugin's module controller (IHYCrossPlatformModuleController). Plugins - Allows you to access the list of plugin descriptors. Unlike the module manager property, it allows you to get descriptors only for this specific module. Plugin descriptors are used to describe a plugin that is stored in the module. In most cases you will use the PluginDescriptor class to deal with the descriptors. Name - Holds the name of the plugin, you can use it to create an instance of the plugin. MajorVersion and MinorVersion - Holds the user-specified version of the plugin. Description - Holds a string that allows you to read the plugin description. UserData - String that stores custom data. RequiredPrivilege - String that defines privileges required to create this plugin. CheckPluginType - Method that allows you to check if the plugin is derived from a specified type. CheckPluginInterface - Method that allows you to check if the plugin implements a specified interface. CheckPluginAttribute - Method that allows you to check whether the plugin has a specified attribute. Please note that MajorVersion, MinorVersion, Description and UserData are optional fields, they can be defined on the plugin side if you need such info, by default they are empty. We won't dig deep into details of custom interface usage (please refer to this article: Passing interfaces between Host and Plugins), but we will look at how the host deals with them. Basically the host object is an object that implements the IHYCrossPlatformHost interface. This interface doesn't have any methods, it just shows that the object is a host. Both ways do the same job, the first is a little simpler, while the second gives you more control over the process. moduleManager.LoadModule("Plugin.dll"); - This method allows you to load a plugin module with a specified path. Module manager will automatically detect the type of the module and will use the appropriate method. Instance = moduleManager.CreateInstance("MyPlugin"); - This method will create an instance of the plugin with the specified name and assign this instance to the Instance variable defined above. hostPanel1.HostPlugin(Instance as IBasePlugin); - This method is used for visual plugins, it can show plugin content in a special container called HostPanel. This is it, with just a few lines of code the host is able to load, create and show your visual plugin.